Order Billing is an application that will be used routinely. Regardless of which billing procedure you implement you will at least print invoices. The two billing procedures and other related concepts are explained below. The user should be familiar with all the options and features available from the Global Setup chapters as they can enhance order processing, billings, and meet specific data entry and procedures required. In the context of Customer Order Processing, billing involves the selection of line items on an order to be printed on an invoice, the printing of the invoice and the posting of billing information to the appropriate Accounts Receivable and Inventory Management files. If you select Bill All Items, all line items will be selected except for the line items which have serial or lot items without a serial or lot number entered. To select a line item that does not have a serial or lot number, you must select Bill Certain Items and select all serial and lot items individually. Each serial or lot item on the order must have its own serial or lot number in order to be billed. 1. The customer's order is entered as a regular order (type O). 2. Specific line items on this order are selected to be billed on an invoice. Note: Cash receipts may be entered for billed orders. There are additional steps, of course, such as determining which items get billed and actually printing the invoice, but for our purposes here the important distinction between the one‑step and the two‑step billing procedures is made in the selection process. 1. 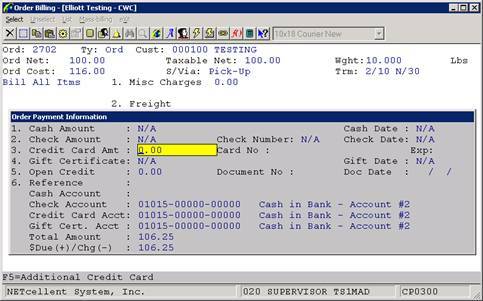 The customer's order is entered as an invoice (type I) order with all items on the order being automatically selected. 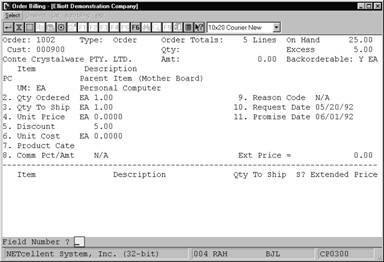 All line items on an invoice type order are selected to be printed on the invoice form. This method is convenient when the order is entered after the merchandise has been delivered or when you are confident that stocks will almost always be adequate to ship all items on the order. Like invoice type orders, credit memos are also automatically selected during entry. Credit memos may not be reselected or altered within the billing application, however. If changes are required, they must be made through Order Entry. The precise steps necessary for selecting orders are covered later in the Run Instructions. In general, the selection process begins with the printing of picking tickets. Only those line items whose request dates fall on or before the request date cut‑off will appear on the order's picking ticket. As the items for the order are picked, the stock clerk will indicate on the picking ticket the quantity of each item that was actually shipped. Once the order has been processed in the warehouse, the picking ticket (or a copy of it) will be sent up to the billing department so that an invoice can be prepared. The billing clerk will review the picking ticket and determine if the quantity that was shipped for each item equals the quantity that was supposed to be shipped. The clerk will then access the order for billing and select on it those line items that appear on the picking ticket, adjusting the quantities shipped to conform to what was actually shipped. After the orders have been selected, invoices may be printed and the billing information posted to Accounts Receivable and Inventory Manage­ment. * Orders are selected for billing one at a time. Enter the number of the order you wish to select for billing, or press the F1 key to display the next available unselected order. * Once the order is selected, changes may be made to fields on the order header as in the change mode of Order Entry. After changing the desired fields you may select one of the following three options regarding the billing of the individual items on the selected order: Bill All Items, Bill Certain Items, and Bill All But Certain Items. * Select Bill All Items, which automatically bills all line items on the order, which appeared on the picking ticket. * Bill Certain Items will go to a second screen where line items to be billed are specifically selected by entering the item number. You may choose to scan line items on the order one at a time by pressing the F1 key. You may also display all line items on the order one page at a time by pressing the F6 key. Each line item that is billed may also have its quantity to ship modified to reflect any last minute shipping changes or back order situations. * Items not specifically selected for billing are not billed with the order. After the order is processed and the invoice printed, the original order remains on file, having line items remaining only for those items back ordered or not selected for billing previously. * Bill All But Certain Items (similar to Bill Certain Items above except that items not accessed are automatically selected for billing). 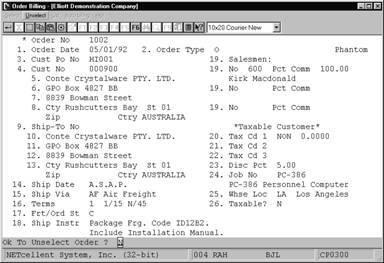 Accessing an individual line item allows the item to be billed or not and shipping quantities to be modified if billed. If the operator answers N to Bill This Item? when the item is accessed, the item will not be selected for billing. * You will be asked to enter the request date from the picking ticket. In order for this application to know which items from the original order were actually printed on the picking ticket it must have this date, which is printed on the top of the picking ticket. See the Print Pick/Pack Tickets And Ship Labels application for detail on what this date is for. * After items have been selected for billing, you proceed to a third screen where the final billing information such as miscellaneous charges, freight charges, tax, commissions and comments may be entered. * The net amount of sales, net taxable sales, order total cost, weight of the items selected for billing ship via and terms display at the top of the screen. * Miscellaneous charges are entered and, if A/R Setup specifies that these charges are to be distributed, the miscella­neous charges account is entered. * Freight charges are entered and, if A/R Setup specifies that freight should be distributed, a freight account must be entered. 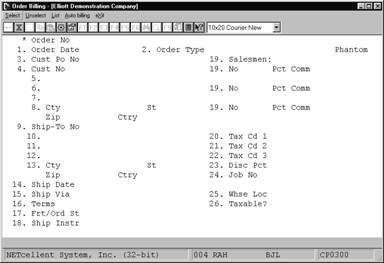 * The sales tax amounts are calculated automatically based on the order taxable amount, order tax percent, miscellaneous charges, and freight, and is displayed for default but may be overridden. * Comments may be entered, which will print at the bottom of the invoice documents. 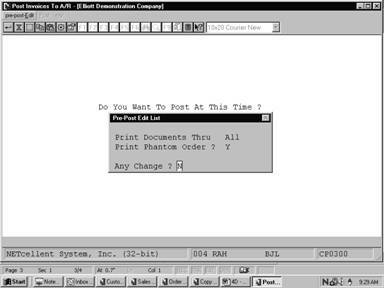 If left blank, a default comment may be entered during the printing of invoices, which will print for those orders not having specialized comments entered here. * At any time it is possible to reselect an order for billing. Item quantities to ship modified in the previous billing selection do not revert to their previous values. Previous line item selec­tions can be modified or cleared and entered from scratch optionally. * Orders incorrectly selected may be unselected (that is, removed from the list of orders selected for billing) by choosing option (U)nselect on the Order Billing menu bar. The unselect module requests a specific order number, or allows you to pull up the next sequential order that has been previously selected by pressing the F1 key. It will then display the order header information and asks if you want to unselect that order. 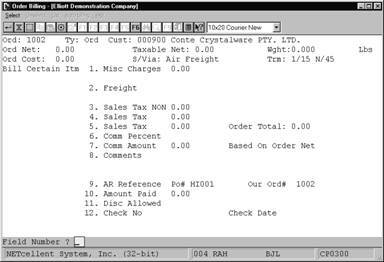 * (I) Invoice and (C) CR memo type orders are automatically selected and may not be unselected. * At any time you may print the Billing Edit List by selecting (L)ist on the Order Billing menu bar. The Billing Edit List will print invoices, credit memos and the billed portions of selected orders as they will be printed as invoice forms for customer billing. * Once billing selection is finalized, invoices must be printed from the Print Invoices application to complete the action of customer billing. Enter the number of the order you wish to select (unselect). Enter the F1 key to see the next unselected order (or selected order). All subsequent fields in this screen are identical to those specified in Order Entry change mode. If you are selecting orders: changes to the order type, customer number, discount percent on first screen and warehouse location are disallowed. All other fields may be changed. Enter the item number of the line item you wish to select (or unselect if Bill All But Certain Items was chosen). Press the F1 key to find the next line item for the order in the same order as they are printed on the picking ticket. You may press F2 to enter a comment in the body of the invoice. After you press F2 you will be allowed to type comments into the area in which the item's description would normally appear. There are two lines of 30 characters each available for such comments on each line item. The comments entered will print on the picking ticket if you select to have them print. A common use for this feature is to explain substitutions and back orders on the previous or following line. Such comment lines may be accessed by means of the F6 key for the purpose of modification. If you press the F6 key, the program will display all line items that have been entered thus far for this order. You may then highlight one of the line items by using the up/down arrow keys. Press the RETURN key to display the highlighted line item. Press the F3 key to insert a comment before the highlighted line item. Press the F7 key to search sequentially for line items on the order. This can be especially useful on orders with large numbers of line items. From the line item entry screen, press the F7 key to search for the item by number or press the F8 key to search for the item by description. This field may not be altered in this program. If a change of this field is required, use change mode of Order Entry. You may change the quantity of items to ship for this line item. 10 numeric digits with 4 decimal places and an optional minus sign (999,999.9999‑). The price per item as entered in Order Entry will display. You may change it in this application if needed. 5 numeric digits with 2 decimal places (999.99). This field shows the discount percentage applied to the full price (unit price times quantity ordered) of this line item, as entered in Order Entry. You may change it, if needed. This is a display only field. 9 numeric digits with 2 decimal places and an optional minus sign (9,999,999.99‑). It shows the full price minus any discounts. This field is your company's own cost for one item. You may change it if needed. If you are using LIFO or FIFO costing method or if the Cost To Use When Posting flag in COP Setup is equal to actual cost, the item unit cost will be calculated when the invoice is posted. This is the date the customer requested the merchandise on this line item. This is the date the merchandise on this line item was promised. This is the lot number of the items being sold and/or returned to stock. This must be a valid lot number. Same as Select Line Items. This is the serial number of the item being sold/returned‑to‑stock. This is a display only field. (9,999,999.99‑). It is the sum of the extended prices of all selected items in this order. It is the sum of the extended prices of all selected items in this order, which are taxable if the customer is taxable. This is a display only field. (9,999,999.999‑). It is the total weight of all selected items in this order. It is the sum of the costs of all selected items in this order. This is a display only field. This is how the order will be shipped. This is the terms for this order. 7 numeric digits with 2 decimal places and an optional minus sign (99,999.99‑). This is the amount of any miscellaneous charges, such as special handling or packaging charges for which the customer is expected to pay. You may change this field if needed. This is the amount of any freight charges the customer is expected to pay. It is the order net plus the miscel­laneous charges, freight and sales tax. This and the following four fields will be entered only for invoice type orders. If the customer sent in payment with the order you may record the cash receipt here rather than in Accounts Receivable. Enter the amount of the payment or simply press RETURN to skip entry of the field. If there is no payment amount entered you will not be prompted to enter the remaining fields. Enter the number of the customer's check. A non-zero check number is required, so if payment was made by some other means than a check will have to improvise a number (the date, for instance). Default to the system date. The payment types entered will depend on the payment sources defined in Global Setup. Refer to the System Manual for Global Setup information and how to set up credit card verification. 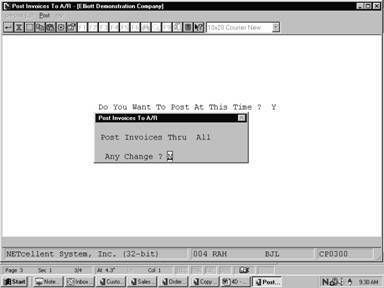 The Post Invoices To A/R application transfers all transactions that were previously created in Order Entry into the A/R Open Item File. In addition it sends this information to other A/R applications such as the Customer File Maintenance, and Salesman File Maintenance applications. This application also updates numerous files in COP and I/M. Consequently the result of posting serves to automatically adjust the balance that a given customer owes your business. 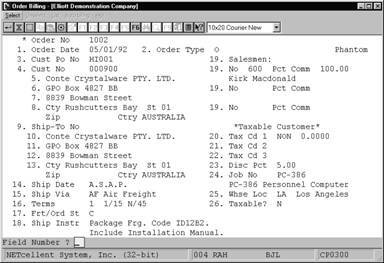 It also affects the cost of sales, and other related variables recorded in the customer and salesman files. Before posting it is recommended to print the Pre-Post Edit list to verify which orders will be updated. When you perform a posting, the system prints a journal of all transactions that were posted to the numerous files. 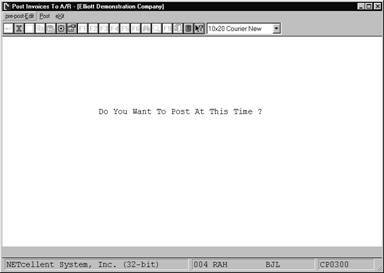 A date in the standard date format 99/99/99. Enter the final date that you want to print. The Purge Posted Invoices application removes previously posted Order Entry transactions. It ensures that the Order Entry transaction file will not become excessively large over a period of time. This purge will affect the amount of information that is available for the Order Inquiry and Available To Promise applications in the Inquiry pull down window. Also, this application allows you to purge quote type orders. · This application runs automatically, and returns to the menu bar when the purge process is complete. Do You Want To Purge At This Time ? Purge Quote Type Orders ?